The Atlantic Division reigned supreme in the Eastern Conference during the 2011-12 season. It not only had four teams qualify for the Stanley Cup Playoffs, but three advanced to the conference semifinals, two to the conference finals, and one played for the Stanley Cup. All five teams have a nice stable of prospects either playing with the big club or patiently awaiting their chance to move up at some point. The 2012 NHL Draft looks to be deep with defensemen, centers and goalies, so this is a great opportunity to fortify the depth chart. Each team has one selection in the first round, which begins June 22 at 7 p.m. ET at Consol Energy Center in Pittsburgh. The Islanders have picked no lower than ninth the past four years and, barring a trade, this year will be no exception. General manager Garth Snow has opted for offense in the opening round in each of the past four drafts, selecting Josh Bailey ninth in 2008, John Tavares first in 2009, Nino Niederreiter fifth in 2010 and Ryan Strome fifth in 2011. The last time the Islanders chose a defenseman with their first pick in a draft was in 2007 when Snow selected Mark Katic of the Ontario Hockey League's Sarnia Sting in the third round (No. 62). 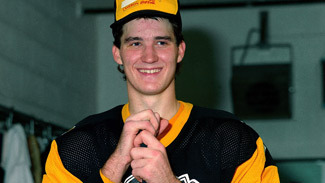 The last time the Isles selected a defenseman with their first pick in the first round was 1995, when Wade Redden of the Brandon Wheat Kings in the Western Hockey League went at No. 2. Strengths: Depth at forward and in goal appears to be strong. Expect Niederreiter and Strome to stick with the big club in 2012-13. Kirill Kabanov may need another year of conditioning with Shawinigan in the Quebec Major Junior Hockey League, unless he takes his talents to the KHL for more money. Kevin Poulin and Anders Nilsson will battle for backup duty behind Evgeni Nabokov. Rick DiPietro (sports hernia surgery) expects to be ready for training camp. Weaknesses: The club has done a nice job stockpiling a good supply of forwards, but it could use some grit along the wings. The organization's top defensive prospect, Calvin De Haan, has been hampered by injuries. De Haan, who underwent shoulder surgery in 2011, was chosen No. 12 in 2009. Matt Donovan could make the jump on the back end following a solid season in Bridgeport. Scott Mayfield, the team's second-round pick (No. 34) last year, was a fantastic choice, but the 6-foot-4, 205-pound defender is at least one year away. Biggest Need: It's about time the Islanders begin looking long and hard at their most glaring weakness: the blue line. They've finished in the Atlantic Division cellar five straight seasons. The club was 27th in the League with a 3.06 goals-against average while yielding more than 30 shots per game. Snow will look to re-sign pending unrestricted free agent right wing PA Parenteau, who had some nice chemistry with Tavares on the team's top line. Left wing Matt Martin, who led the League with 374 hits, is set to be a restricted free agent. Defensemen Steve Staios, Mark Eaton and Milan Jurcina, and goalie Al Montoya also are free agents, and there's a strong likelihood none of those players will return. At the start of the 2011-12 season, Sean Couturier, Brayden Schenn, Matt Read, Erik Gustafsson, Marc-Andre Bourdon and Zac Rinaldo weren't household names. By the end of the season, they were vital cogs to a Flyers team that was ravaged by injuries to key players throughout. The Flyers dressed eight rookies many nights, stayed within a few points of the Eastern Conference lead, and polished off the favored Pittsburgh Penguins in six games during the opening round of the Stanley Cup Playoffs. General manager Paul Holmgren made two bold moves just prior to the opening round of the 2011 NHL Draft when he dealt Jeff Carter to the Columbus Blue Jackets and Mike Richards to the Los Angeles Kings. The move enabled to Flyers to gain a package of high-profile prospects, including the No. 8 pick in the draft that the organization used to select two-way dynamo Couturier. In addition to the rookies, acquisitions Jaromir Jagr, Jakub Voracek, Maxime Talbot, Wayne Simmonds and Nicklas Grossmann also played big roles. And dare we forget the ascent of Claude Giroux and Scott Hartnell. Strengths: The Flyers are loaded at forward and have basically set themselves up to remain dominant in that area within the division for many years with Eric Wellwood, Danny Briere, Couturier, Schenn, Read, Giroux, Hartnell, Simmonds, Talbot and Voracek. The team finished second in the regular season with a 3.17 goals-per game average and ranked fourth with 32.2 shots per game. Weaknesses: There are two areas Holmgren might look to bolster either through the draft, free agency or trades this offseason. First and foremost, the club needs to get more mobile or bigger along the blue line. The absence of captain Chris Pronger was most felt during the setback to the New Jersey Devils in the conference semifinals. Additionally, though Ilya Bryzgalov is signed for eight more years, the organization remains fickle when it comes to grooming a player from within between the pipes; depth is needed in goal. It's been rumored the Flyers might move 23-year-old backup goalie Sergei Bobrovsky and his $1.75 million contract, but nothing seems imminent. Biggest Need: Holmgren's long-term plan should factor in more depth on defense as well as a young and aspiring goalie who can build a resume within the organization. The days of the quick fix in goal are getting old in Philadelphia. Look for Holmgren to re-sign defenseman Matt Carle with Pronger's future in doubt. The team also will look to re-sign Voracek, who played in almost every situation for coach Peter Laviolette. The Penguins had quite the regular season, finishing third in the League and second in the Eastern Conference. But an opening-round playoff loss to the Flyers in six games left everyone scratching their heads in search of answers. The Penguins have traditionally done well via free agency and through the draft, and this offseason should be the same. According to reports out of Pittsburgh, 25-year-old restricted free agent defenseman Matt Niskanen is close to signing a multiyear deal, and that would be a solid start for general manager Ray Shero. Strengths: The Penguins offer plenty of size and depth on defense and possess a few solid NHL-ready prospects -- defensemen Simon Despres and Brian Strait were impressive in their limited postseason appearances. The club likely will cut ties with unrestricted free agent goalie Brent Johnson, 35, now that Tomas Vokoun has been acquired to back up Marc-Andre Fleury. For now, the team remains deep down the middle with Evgeni Malkin, Sidney Crosby and Jordan Staal. Weaknesses: The Penguins have several key players in the final year of their contracts before becoming unrestricted free agents on July 1, 2013, including Crosby, Staal, Pascal Dupuis and Ben Lovejoy. Staal could be the centerpiece of a blockbuster trade, if that's the route Shero wants to go. After all, the cost of keeping Crosby may necessitate making some tough choices and some player maneuvering. Biggest Need: Expect the Penguins to begin stockpiling their prospect cupboard with forwards at the draft and, perhaps, a few more defensemen. Shero is a big believer in drafting defenders because, according to the GM, "There is no better asset to trade than a young defenseman." A goalie might be targeted to mature and learn under Fleury. Despite the disappointing end in the Eastern Conference Finals against the New Jersey Devils, the Rangers not only gave their fans plenty to cheer about this season, but reason for future optimism. There was rookie left wing Carl Hagelin, who was a perfect fit under coach John Tortorella's never-give-up-on-a-puck mentality. Hagelin was undoubtedly New York's best first-year player in 2011-12. There was left wing Chris Kreider, one of the most explosive skaters for the club throughout the playoffs. Kreider was signed by the Rangers after completing his third season with the NCAA champion Boston College Eagles, and never missed a beat in the fast-paced, pressure-packed atmosphere of the NHL postseason. The Rangers rely on tremendously gifted, shot-blocking defensemen, so restricted free agent Michael Del Zotto will be a priority this offseason. The third-year blueliner had career highs in goals, assists and points, and proved to be as valuable as Dan Girardi, Ryan McDonagh and Marc Staal throughout the playoffs. Strengths: Assuming Del Zotto is locked up long-term, the Rangers appear set along the blue line and in goal with Henrik Lundqvist. There's also depth on the third and fourth lines with Hagelin, Brian Boyle, Mike Rupp and Artem Anisimov. Brandon Prust, 28, and Ruslan Fedotenko, 33, are pending unrestricted free agents. Weaknesses: The Rangers signed center Brad Richards to a $60 million contract last summer, but the team again will be in the market for a scorer through free agency and/or the draft after averaging barely two goals per game in the playoffs. New Jersey forward Zach Parise is the top free-agent forward available, so expect the Rangers to make an offer -- even though the Devils' captain told the media last week he would not play for the Rangers. The team might revisit trade talks for Columbus wing Rick Nash. Rangers general manager Glen Sather attempted to land Nash at the spring trade deadline but failed. Biggest Need: The Blueshirts need more production up front, particularly down the middle of the ice. Sather will look to fill that void via free agency. He might also be seeking a top-four defenseman to lighten the load on the big four (McDonagh, Girardi, Del Zotto, Staal). It isn't often mentioned, but the team should consider obtaining a future No. 1 goalie behind "The King." The big story for the Devils entering the NHL Draft is the fact the team opted to keep its first-round pick. As a result, the organization must now forfeit either its 2013 or 2014 first-rounder as punishment for the salary-cap circumvention committed in the original contract given to Ilya Kovalchuk two years ago. The club came within two victories of earning its fourth Stanley Cup since 1995, but a 6-1 loss in Game 6 against the Los Angeles Kings ended their attempt at becoming only the fourth team in NHL history to rally from a 3-0 series deficit. The two biggest concerns entering the offseason involve re-signing unrestricted free agents Zach Parise and goalie Martin Brodeur. Brodeur, 40, appears as though he'll play one more season, and the chance he'll be manning the cage for anyone but the Devils is slim to none. Parise has expressed a desire to stay, but at what cost? Historically, the Devils don't have a very good track record of keeping their big-name free agents; see Scott Niedermayer, Brian Rafalski and Scott Gomez. Strengths: The Devils have franchise cornerstones at key positions. They took Adam Larsson with the No. 4 pick in last year's draft and despite hitting the wall at the end of the season, he appears to be the real deal. Adam Henrique, a first-round pick two years ago, proved this spring he is an elite, game-changing forward. New Jersey also has Travis Zajac, David Clarkson and Jacob Josefson as under-30 building blocks. Weaknesses: Though the emergence of Henrique was a pleasant surprise, the Devils still lack depth down the middle. Additionally, there may be holes to fill on the wings as Petr Sykora, Alexei Ponikarovsky, Steve Bernier and Ryan Carter are unrestricted free agents. Deficiencies in goal could be resolved if Brodeur decides to return and the club re-signs 39-year-old UFA backup Johan Hedberg for one more season. If the team loses UFA defenseman Bryce Salvador, defensive depth might also be a concern. Biggest Need: The Devils are in a position where they can address their needs at center and wing through free agency and trades. They'll likely fortify those areas in this year's draft as well. If Salvador does not re-sign, look for the Devils to target a defender in the draft with shutdown tendencies to complement the more offensively minded Larsson. It's possible the organization may draft another player in goal. Right now, the top three goalie prospects within the organization are Scott Wedgewood, Keith Kinkaid and Jeff Frazee.